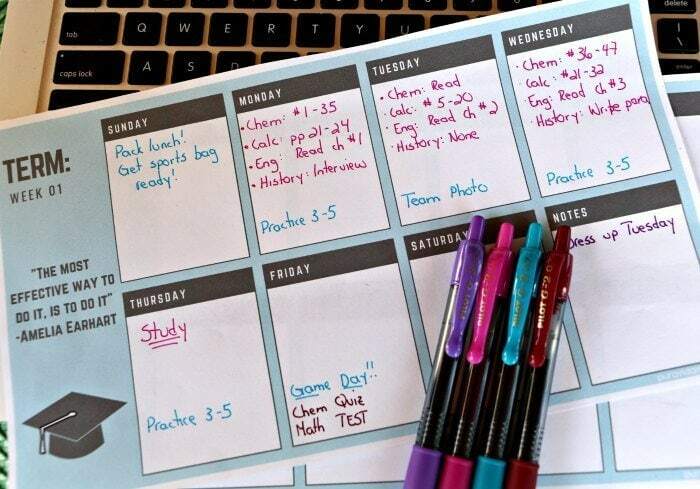 This printable high school homework tracker will make back to school easier. Includes customizable date, inspirational quote, and plenty of extra room for homework assignments, notes, and extra curricular activities. Nothing- and I mean NOTHING- says back to school like new writing implements. 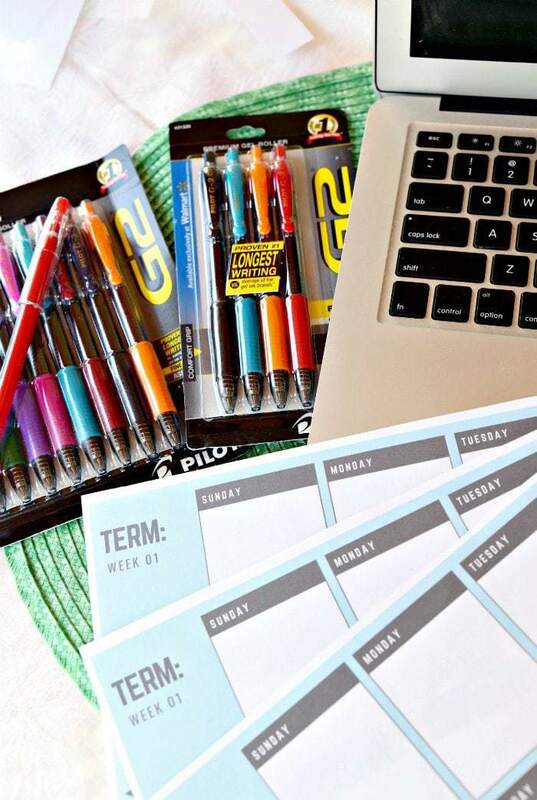 I have so many fond memories of getting the perfect new pens at back to school time, and using them to write notes to my friends (elementary school), using my steno notebook to keep track of homework in various classes (junior high school) and using them in high school to keep track of my homework AND after school commitments. High school means quite a bit of responsibility for our kids. Oftentimes teachers are asking the students to take more responsibility for their learning, and there’s a huge focus on graduating and going to college. Couple that with after school activities or jobs, and many kids learning to drive- there’s a lot to keep track of. One of my favorite back to school classroom lessons (besides my super fun first day of school Spanish class lesson) centered around planning and organization. I taught an all girls advisory/homeroom for many years, and we always started with a good calendar that had enough space for homework and class- but also for other responsibilities. What about uniforms? Or the days they needed to pack a lunch for an away game? Long term goals like tests and quizzes and projects? And of course, practice, jobs, clubs… you get the idea. 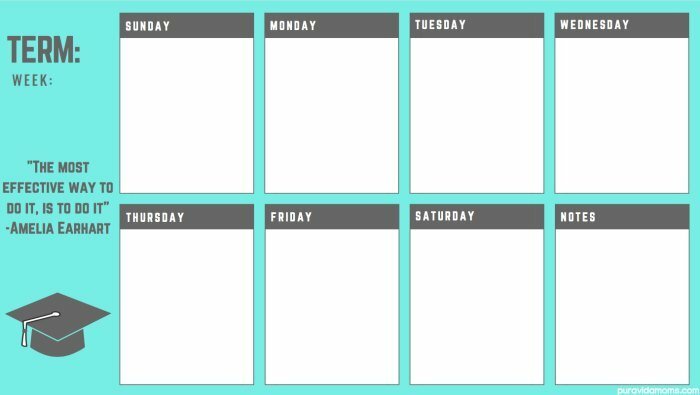 So that’s what I created this free printable high school homework tracker- it’s got a cute graduation hat to keep students’ eye on the prize, and a motivational quote. 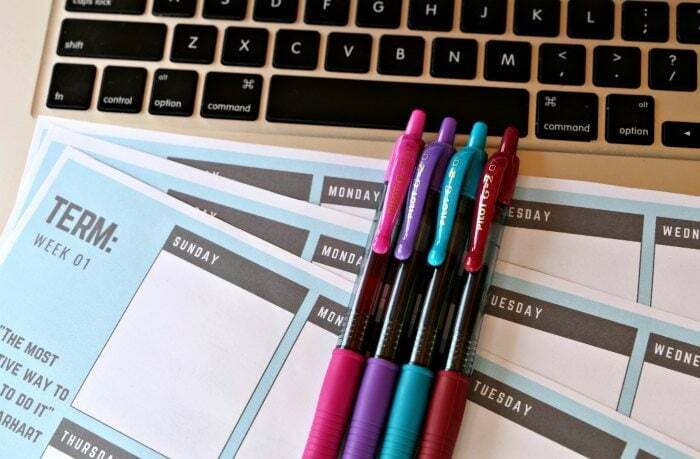 You can customize the term and the week, and I made the days of the week white so that they could be colored in and doodled on with America’s #1 pen- the G2® Pens by Pilot Pen. Plus, research overwhelmingly shows that writing down notes keeps them in long term memory– and that’s what I always recommend using a written planner as opposed to a digital one. 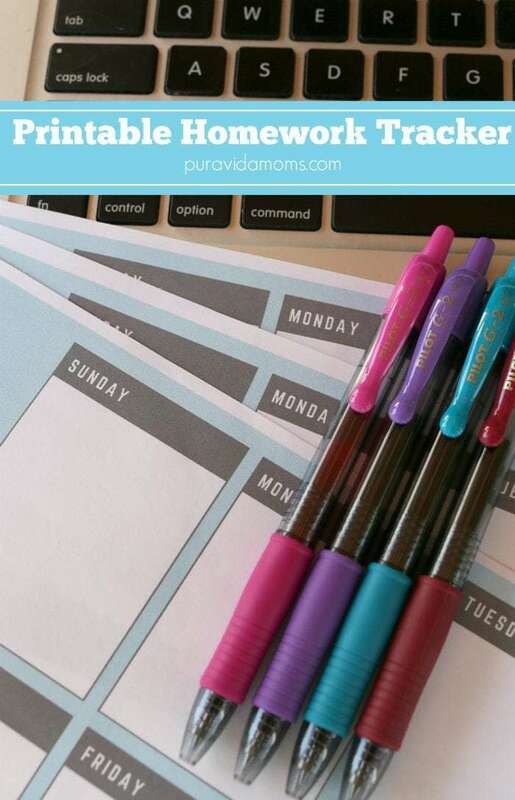 Simply print the number of copies of the free printable high school homework tracker at the link here– and then start to personalize it! You could shrink it down to half size and put two per page, print it double sided, or punch holes in it and put it in a three ring binder so that it’s easy to find. I would probably end up folding it in half each week and putting it in a homework folder- but whatever works! Then, choose a different color for each class, or each type of activity. In the example below, I had one color for after school activities (teal), one for homework (hot pink) and one for tests and quizzes (maroon). I do my back to school shopping at Walmart because I can also get my groceries- it’s a one stop shop. They had tons of versions of Pilot Pen, I love these G2® Pens since they are gel ink and write SOOO smoothly. Plus I LOVED the hot pink color that came in the big package. Right now you can get $0.75 off any G2 4 pack or larger with this handy coupon. I found the pens in the Home Office and not in the back to school supplies, so definitely note that for when you get in store. And that’s it! 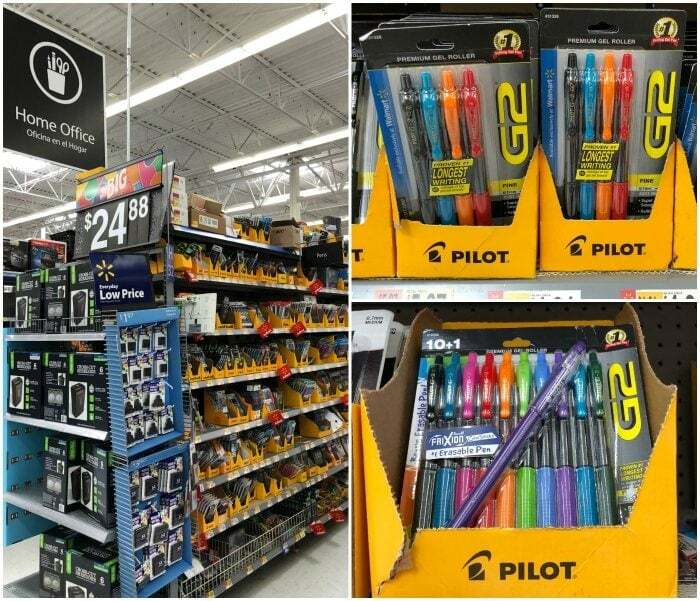 Easy-peasy- just print the handy printable, grab your G2® Pens by Pilot Pen at Walmart with the coupon, and prepare to have a great school year! Print free high school homework tracker here!